Five ways to amplify your Scottish dining experience. With its oft-grey weather, buildings of blackened stone stained by centuries of billowing coal smoke, and a reputation as one of the world’s most haunted cities, Edinburgh could be the very embodiment of Halloween. A 1,000-year history of plague, witch-burning, murder, and general terror can do that to a place and the signs are everywhere, even today. From the costumed tour guides leading groups through eerie underground labyrinths by lamplight to the occasional passerby looking for good luck by spitting on the Heart of Midlothian, a former site of many public executions; the ghosts of Edinburgh’s past are alive and well. But I won’t be dwelling on the city’s macabre history. This is a food column after all and scaring off appetites is hardly a recipe for job security. Rather, I’m here to quiet another kind of fear: the fear of Scottish food. Despite the horror stories and bad jokes surrounding Scottish cuisine, I found much to embrace on the plate during my visit this summer, especially when said plate was piled high with ingredients from nearby farms. It seems that Edinburgh is beginning to cast off its darker past when it comes to food, thanks to a modern-day counterculture and a thriving Slow Food movement. However, due to Scotland’s cool, rainy climate, meat continues to rule the day, which means green leafy vegetables can be hard to come by. But just ignore your cardiologist’s well-meaning advice for a few days and go with what’s good: sausage for breakfast, pork shoulder for lunch, and steak for dinner. You’ll do so with the knowledge that your meal was likely raised nearby and with great care. Here are five ways to eat like a local in Edinburgh, because that salad bursting with crunchy romaine, juicy tomatoes, and crisp cucumbers can wait until you get home. 1. Fill up on comfort with a side of kitsch at MUMS. After an overcrowded five-hour train ride from London, dinner at MUMS Great Comfort Good was a much-needed post-travel day hug on my first night in Edinburgh. Cast your caloric concerns aside and embrace the moment with a steak and ale pie – tender chunks of beef and rich ale gravy under a balloon of golden pastry – or a plate of sausage and mash – two or three snappy sausages of your choice piled high atop a pillow of silky potatoes afloat in a pool of peppery gravy. 2. 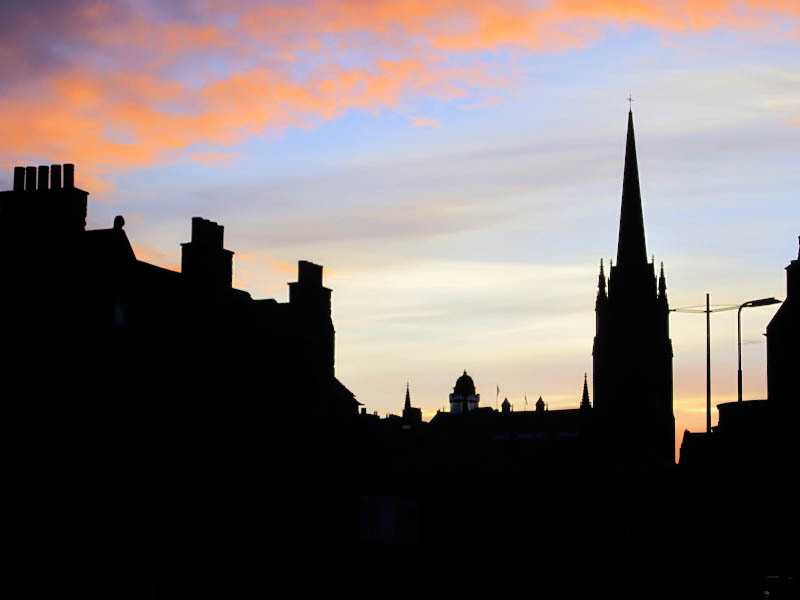 Grab a glimpse of Edinburgh’s historical foodways. Look beyond the Royal Mile’s gimmicky souvenir shops hawking all things plaid for a journey back in time via Edinburgh’s impossibly steep alleyways. Signs above each alley entrance serve as guideposts to the city’s ancient “closes,” or neighborhoods, which often found residents clustered together by occupation. Seek out the ghosts of bakers, sugar refiners, butchers, and fishmongers down Baker’s Close, Sugarhouse Close, Fleshmarket Close, and Old Fishmarket Close. When I asked why home and livelihood cohabitated in historical Edinburgh, a present day resident replied, “Other than the fishmongers, who would have wanted to live near the stench of an 18th century fish market?” Touché. 3. Have coffee with Harry and Dumbledore at The Elephant House. As J.K. Rowling’s writing spot of choice for the Harry Potter series, The Elephant House is a cozy tea and coffee shop ideal for a break from traversing Edinburgh’s steep alleys and stairs. Granted, you’ll hardly be the only Potter fan with the idea, but the space is well-known as a writer’s haven and worth a stop. Head to the backroom where the tables overlook Edinburgh Castle and soak up some magic. 4. Eat, drink, and repeat on West Bow Street. When hunger gets the better of your sightseeing plans, make a beeline for West Bow Street. A winding, narrow street that connects the Royal Mile to Grassmarket, West Bow is the belly of Edinburgh and home to some of the best food and drink in town. Lunch on a hog roast roll with applesauce from Oink, sample small-batch vinegars and spirits from Angus at Demijohn, and earn your haggis-eating badge with dinner at Maison Bleue, where French technique gussies up traditional Scottish dishes, or The Grain Store, where the season dictates the menu. 5. Say goodnight with a wee dram at The Bow Bar. Whether you’re a whiskey drinker or not, make like a good Scot and pay a post-dinner visit to The Bow Bar. Directly across the street from Maison Bleue, The Bow Bar is all dark wood, gleaming brass, and lively pub banter. 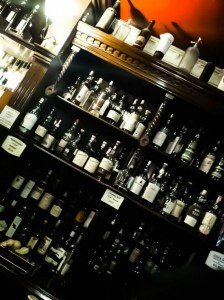 Overwhelmed by the wall of whiskies behind the bar? Place yourself in the savvy hands of the bartenders who are more than happy to guide your taste buds from sweet to smooth to smoky.